Dialectical Behavioral Therapy (often shortened to DBT) is a skills-based approach to psychotherapy. It incorporates aspects of mindfulness and cognitive-behavioral therapy. The word “dialectical” refers to the therapy’s focus on learning to balance and tolerate opposites, and release attachment to black-and-white thinking – reaching a comfortable balance between acceptance and change. Read more about DBT below! 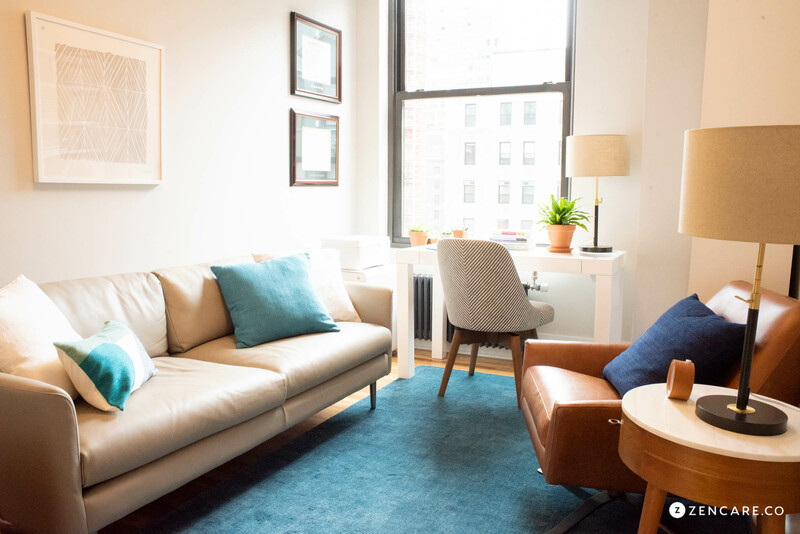 Learn what to expect in sessions, how to use your insurance or alternative payment options, and where specifically to find DBT therapists near you in New York City. You can filter by insurance, location, approach, identity, and more. Once you’ve filtered by your preferred options, click on any therapist’s profile to watch their introductory video and schedule a free call. How much does DBT therapy in NYC cost? What issues can DBT therapists help New Yorkers with? What should I look for in a DBT therapist in NYC? Find an DBT therapist in NYC who accepts your insurance below. Can't find your health insurance, or many DBT therapists listed within your health insurance network? It’s helpful to know that some therapists, especially in NYC, are unable or choose not to take health insurance. If you find a counselor who accepts your health insurance, you may only pay a copay at each session. These usually range from $20 to $40 per session. If you cannot find an DBT therapist who takes your health insurance, you will pay for therapy sessions out of pocket. In these cases, DBT therapy in NYC costs on average $150 to $250, for a 45-minute session. You can also seek DBT therapy at a sliding scale rate, as explained below. You can find DBT therapists who offer sliding scales in NYC below. Borderline personality disorder: DBT was originally developed for use with women who have borderline personality disorder, and it is considered the most effective treatment for the 2% of the population with BPDs. Depression: In 2016, the New York Department of Health reported nearly 1 in 10 New Yorkers has depression . DBT is an effective treatment for depression. DBT can also help with other issues, including emotional regulation, interpersonal skills, and/or tolerance of distress. What happens in the session depends on whether you’re attending an individual or group DBT session. In an individual DBT session, your therapist will check in with you about your experiences since you last met. You’ll discuss how you coped with any challenges – e.g., if you were anxious on the subway, were you able to manage your anxiety with emotion regulation? Or if you experienced overwhelm due to a life stressor, were you able to implement one of the mindfulness skills you learned to accept the unpleasant reality, and stay in the moment? In a group DBT session, a therapist will lead you and other participating individuals through exercises designed to help you learn and practice concrete skills. Most sessions are a mixture of educational content and hands-on practice. Group session are also likely to include review of the previous week’s content and a discussion of how group members have been applying the skills learned, as well as attention to any challenges experienced in doing so. When looking for a DBT therapist, you’ll want to make sure that they have advanced training and/or certification in DBT. Many DBT therapists have certification from the DBT-Linehan Board of Certification, which requires that providers demonstrate competence in using evidence-based DBT techniques. Additionally, you may want to discuss potential therapists’ experience using DBT as a treatment for your particular concern. For example, if you’re looking to use DBT to help you overcome an eating disorder, ask the therapist if they have experience working with that population. You’ll also want to clarify what kind of expectations your therapist has for the structure and frequency of DBT sessions. Some have strict rules about participation in the full DBT program (including weekly individual and group sessions) while others may offer more flexible treatment options. And finally, weigh the benefits of each therapist from a practical standpoint! Is their office close enough to your home, or work, that you’d be able to attend sessions regularly and relatively easily? Could you feel comfortable being open with this therapist, and sharing realistic updates on your progress? When you find the right DBT therapist near you, you’ll be on your way to effective treatment! Ready to get started? Find the best DBT therapist in NYC near you!